All Air-Stirrup Ankle Braces (except for the pediatric model) come with a patient guide providing information on brace application and optional rehabilitation exercises. The Standard (Large), Training (Medium), and Small size Ankle Brace is available individually or as part of an Ankle Sprain Care Kit™. The Pediatric Ankle Brace is designed for children 2 to 6 years of age and is ideal for ankle stabilization in hemophilia patients. Extra long straps are available. 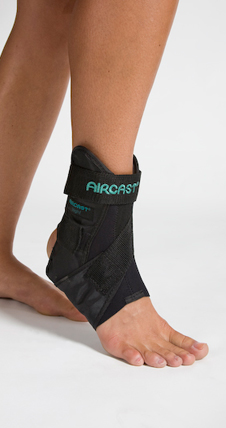 The AirSport Ankle Brace incorporates clinically proven Air-Stirrup® Ankle Brace features, such as a semi-rigid shell and aircells, to provide comfort and support. Additional compression and stabilization is provided by ATF (anterior talofibular) cross strap and integral forefoot and shin wraps. The unique “step-in” design (toes first inserted into the back of the brace) and automatic heel adjustment make the AirSport extremely fast and easy to put on, just: Step In, Strap Up, And Go!